What does it take to be successful on Twitter? With over 100 million active Twitter users, it is sometimes very hard to know whether your Tweets are the ones being seen and clicked on. Recently, after reaching over 1 million updates sent via Buffer, we have taken a look at all our users to see how performance has changed with it. The goal was to help anyone to get more out of Twitter based on this data. “People that start to Buffer their Tweets increased clicks on links they posted by 200% within 2 weeks of using. The amount of retweets doubles on average. Finally Buffer users increase their follower count by 104 followers within 3 weeks on average. Of course, the most important question here is, why does scheduling Tweets with Buffer give you these results? On top of everything else, there were 2 key reasons that triggered the increased performance through making use of Buffer. When people sign up for Buffer, the App picks 4 default times, which are optimized to give you a higher exposure for your Tweets. 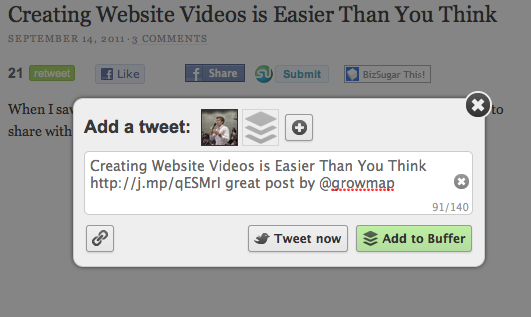 Now, whenever you add a Tweet to your Buffer, it will automatically be sent out for you every time at these optimal slots. These better timings were the most important reason that people increase engagement with their Tweets. You don’t have to worry about when you are Tweeting and can simply drop the Tweet into your Buffer and let it do the rest. Buffer Tweets via your mobile phone: This works from any device. Simply hit the “send via email” function whilst reading a post and send it to add@to.bufferapp.com. Automatically the App will take your headline in the subject line and link from the body and add it as a Tweet to your Buffer. By allowing you to add Tweets more easily from anywhere you are, frequency of Tweeting went up dramatically. This was important as it gave followers more trust in your ongoing stream of great content. How To Get The Most Out Of Twitter? The people which went even above the 200% increase in clicks after starting to use Buffer had some very specific ways to use the App. They would spend about 10 minutes each morning to go through their Twitter lists and RSS readers and add the best content to their Buffer. They were then able to provide the best content for their followers throughout the day and able to interact more. Buffer, as many users mentioned, would free them up to have more conversations, knowing that great content would already be Tweeted out for them. This is one of the things I am learning now on tweeting. The more you tweet, the more chances you have of people reading your tweets. And I agree with what you said…timing is very important because your tweet will just turn to waste if nobody sees them. Thanks again for the tips. This is very interesting but theorectically it make sense. If you do post your tweet at the optimal time (time which most people is using the service). Then chances are the number of clicks or views on your profile will increase. I do not know if a rise of 200% is realistic but an increase is definitely significant. Flexispy would love you to read ..Whatsapp spying apps – How to spy on whatsapp messenger on a smart phone? We abide by Twitter’s Rules and Facebook’s Policies. Check out the tips in my Twitter Best Practices post. In the last two weeks I have found sooo much info on how to take advantage of twitter. Most of the tips here I hadn’t seen yet. Great stuff. Monitoring with applications like hootsuite and the like can also prove very useful! Very comprehensive guide Gail. Twitter is really useful for online marketers or even businesses to keep their network updated. I think choosing the optimal timing to post tweets is the best way to get retweets. OK So This is New To Me Thank You For This Info… On twitter buffer i Will Look At it Thank You. Buffer sounds like a really powerful app. I haven’t thrown myself into Twitter just yet, but I love reading about apps that make it easier to tweet and get the most out of twitter. Thanks. It seems that the number of services like Buffer are increasing in number. It’s not that I’m complaining but we need to do several tests to see which one is the best fit for our social media campaign. 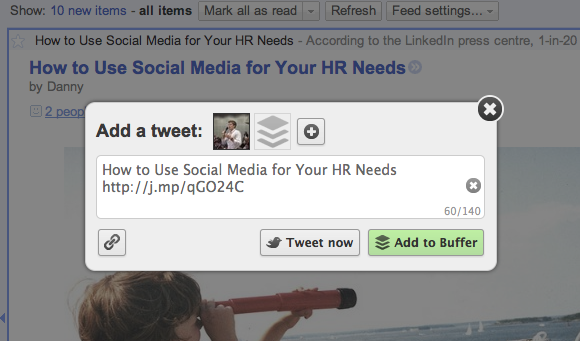 MarketMeSuite, HootSuite, and now Buffer. I don’t think you can go wrong with any of these but focusing on only one is the best way to go. I find doing #ff gets me alot of followers. Also, finding twitter pages that are dedicated to getting more followers. The people that say “follow so and so and get 10k followers immidiately’ is nonsense. Thanks for sharing these tips! Thanks for your post, i am likely going to try out buffer from now. Aritra Roy would love you to read ..EXCLUSIVE Photos From The Set Of Total Recall Featuring Colin Farrell And Jessica Biel! Buffer is a neat little app everyone should use. I’m just afraid that, like with any other good thing, this one will soon come to an end. Do they have some kind of deal with Twitter? What exactly are the right times to schedule tweets that have a high chance of getting retweeted? That is a good thing to know because I just started using buffer this weekend. Now I am feeling a bit more confident that it is not a waste of time. Twitter is one of my primary traffic sources and this could be a great way to optimize my tweets. I think that there is a lot of room to improve my click through rate. I’m going to check it out, thanks! Hugh Kimura would love you to read ..Does Your Interest Pass The Alarm Clock Test? I have been lacking behind when it comes to twitter and using it for promoting my blog. Frankly I dont know who to do the right way without spending a lot of time on it. And I dont like automation. A 200% increase of clicks is a pretty bold statement. I just signed up and installed the FF and Crome extensions. Once I figure everything out I’ll add it to my phone as well. I’m curious why you didn’t use their referral feature for this post? It looks like you get more space with each referral. Thanks for the great tip and resource. Hi Gail, I’m assuming this is a guest post from Leo Widrich, but I didn’t see his bio box in the post. Buffer is truly gaining in popularity and it’s easy to see why. The features are simply awesome. I would love to see Buffer adding Facebook to the options which I understand is coming really soon. Thanks for the post! Thank you for pointing that out. That is a drawback to not having GrowMap set up as a multi-author blog. I have added an intro to that affect to both posts that Leo has provided here. Having conversation with people on twitter helps too. the more people use your handle, the more exposure your profile gets. you just don’t tweet links all the time, try taking part in active conversations. I think this is a very good option for twitter lovers. It would make a lot of difference to do this since it will be a lot easier to tweet great blogs. And this by far is giving me a great info. The website that I like and enjoy that sounds very similar to Buffer is Hootsuite. It is free, easy to use, and has a lot of different things that you can do with it. The two things I love are that you can schedule posts or tweets for a certain time and select a ton of different social networks you want them to go out to. I’m a HUGE fan of Buffer. Their app is well worth the monthly cost and the support is fantastic too. Whenever I’ve had any questions I would usually hear back from Leo within an hour. Ooh forgot, my one gripe with Buffer is that you can’t push new tweets to the top of your stack. Everything goes at the end. The net result is that if you have a deep buffer of Tweets your only option is the Tweet now button. For me the best option is a Tweet Now, Schedule Soon or Schedule. This would allow me to send out timely updates, schedule newer things at the optimum time and then schedule evergreen content for later. Joe would love you to read ..Harassed by Groupon and Living Social Salespeople? Tell us! I would like to you use twitter more not only for me but for my clients as well. I just always thought automated twitter posts was defeating the purpose. Well, twitter has been one of those sites that were able to contribute a lot in online marketing. And a good way to meet and communicate with friends. I’ve been a big fan of Buffer and using it for last 2 months. It’s really great to share things via twitter. I really don’t know that I can share from Google Reader as well, that’s something new for me. Thanks a lot for sharing such useful points about buffer. Thanks for the informative article. I have never heard about buffer. I am using twitter but I don’t know about Buffer app. Thanks to you that I come to know the very important site. I think it will help me. Hi there. Thanks for sharing this. It’s a very nice info. I’ve been looking for ways to help my SEO work by using Twitter as one of the media. Thanks to you! Interesting article. I am going to totally look into posting more frequently but buffering them. Here is a great twitter 101 article for anyone just learning about twitter. I find Twitter to be a great news spreading tool. But sometimes i notice that my friends use Twitter instead of Skype or phone:)). I really do not need to read all of their conversation on Twitter. Is it a lack of knowledge or a cultural thing, don’t know, but it is disturbing, so i just close the twitter tab in my Mozilla or I unfollow in extreme situations. I have not used Twitter anywhere near as much as I should. Your numbers are very convincing. I am off to setup an account. Right after I bookmark this site and check out a few more articles. John would love you to read ..Yeast Infection in Men Not to be Ignored. Its interesting to let buffer do the work for the rest of the day. In the home panel, one can add as many tweets as one wish and can even install a broswer extension for Chrome, Firefox, or Safari it helps us add tweets from any page we’re on. I have used Twitter Buffer but not to it’s full effect. You have really given me quite a few ideas on using it in a more effective manner.